The URWB-7 Extra Large Parts Basket allows for thorough cleaning, while reducing the number of damaged and lost parts. 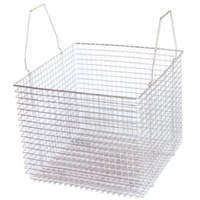 Baskets make it easy and safe for workers to handle valuable components. Clean-Out-of-Place (COP) parts washers handle a wide variety of disassembled process parts, including fittings, clamps, gaskets, hoses and pipes. These parts are often placed within stainless steel COP baskets to ensure thorough cleaning, to keep operators safe and to avoid damaged and lost pieces during the cleaning process.